Phil: I was reminded that a review of Andrew Smith’s book Moon Dust was overdue while sitting in a nearly empty cinema (10am showings are great if you want it quiet) waiting First Man* to begin. The thought almost persuaded me not to open my cinema treat packet of Maltesers. The book charts Smith’s efforts to track down and talk to every man who has walked on the moon and see how the experience affected them. Walking on another planet is, let’s face it, the most exciting and impressive thing anyone can ever do. There are many years of build-up, some terror as you sit on top of a bomb that will fire you into space and a huge job list from NASA once you arrive. All the time knowing that every single component in your equipment has been chosen because the person building it tendered the lowest price. You rely on a machine so complex that even if the agency achieves it’s 99.9% success rate, several hundred parts will fail. There’s no intergalactic RAC to come and rescue you either! Once you’ve splashed down, been hauled out of the sea and returned home, what do you do next? The astronauts’ answers to this are fascinating. Some stay in the system fighting to get man back out into space and back to the moon or even Mars. Others drop out and start painting as a way to try to make sense of the experience they have been through. Alan Bean cleverly includes dust from his space suit badge in his paints so everyone buying a picture owns a little bit of the moon. This doesn’t appear to be a cynical marketing ploy, more a way to convey the experience. Along the way, there are insights into the world of the Apollo programme. Astronauts weren’t that well paid. They didn’t receive media training, even though they would become some of the most famous people on the planet. Wives were expected to be part of the show, but not get in the way. Space bases aren’t situated in bustling towns and Cape Canaveral was basically a swamp when they all first moved there. This is a portrait of a very different world from the one today. It’s all history and not even recent history. Apollo was a bubble of optimism where the US, while bogged down in the Vietnam war, offered a chunk of the future. Kids who had grown up on science fiction thought they were seeing the first days of something great, little realising that a couple of missions in, the public would be so bored of the whole thing that the TV networks couldn’t be bothered to show landing live. An enjoyable read, it probably helps if you are a little bit geeky and love space things as the author experiences the wide-eyed wonder of meeting his heroes. Some turn out to have feet of clay, but most are still clad in moondust. Phil: Warwick Words literary festival has re-invented itself this year as a literary history festival. I went along to a few sessions and was fascinated by the life of Warwick Castle’s housekeeper and the local hiring fairs. I’m told that many of the other talks were brilliant, but some of us have to work. One session that didn’t seem to fit the pattern was Marcus Berkman talking about Star Trek. This didn’t matter, I beamed in anyway. Only the day before did I realise that the TV show was 50 years old. That counts as history to me. Marcus is a lifelong fan of the series, both in original and spin-off forms. The talk was based on his enjoyable book Set Phasers to Stun, both a history of the show and it’s production as well as a critique of many of the episodes. This is proper nerd stuff. I loved it but then I can just about place most of the original series episodes from the descriptions thanks to repeated showings on TV. In Marcus’s book, there’s interesting trivia from behind the scenes, not a happy place to be it seems a lot of the time. Characters came and went as the series settled down and all the familiar elements. As the book progresses through the various incarnations, Berkman identifies a huge problem faced by the writers – running out of storylines. Even within the 79 original Trek episodes, there were plenty of very similar plots. Some blame Gene Rodenbury’s obsession that the cast had to be in terrible jeopardy every week, and he liked them to come up against god-like foes (this is one reason why the first film bears more than passing resemblance to the TV episode The Changeling). Berkman describes it as the “plant of the week” plotting style. The followup Next Generation enjoys 178 shows which really did give the writers a problem. Basically, even with a team working on the series, you can’t avoid duplication, or at least your obsessive fan base spotting parallels. It must be really tempting for TV and film executives to stick with succesful series. Witness the current trend for re-boots of both films (how many Spidermen do we need?) and re-hashing TV comedies. We’ve had to consider this for our novels. There is a story arc, and the original plan involved 7 books. We’ve loped this back to 5 as sketching the basic plots out, we reckoned this was just enough to do the job. Any more and we’d be stretching the plot or repeating ourselves. It’s hard enough to avoid doing this and we’re only working on book 2! Phil: I love a bit of sci-fi. Not the heavy stuff with sprawling stories that span aeons, the more focussed tales where we crack on, have a bit of action and not too much psycho-babble. A series of recent train rides gave me the chance to indulge myself thanks to a couple of very different books picked up in Housemans excellent second hand section. 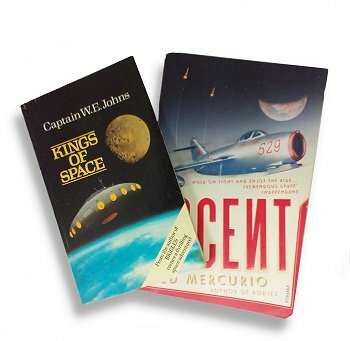 Kings of Space by “Biggles” author Captian WE Johns was published in 1954 and is typical of it’s time. A test pilot and his son are out hunting deer in Scotland when they see a flying saucer. Taking refuge in a nearby manor house it turns out they have stumbled upon the lonesome professor who has solved the problems of space flight by powering his ship with cosmic rays rather than all that pesky rocket fuel. Our two heroes, the prof and his butler embark on a series of adventures visiting the moon, Venus and Mars in quick succession. Very quick as the whole thing is over in 175 pages and it takes nearly half a book to leave the Earth. Each landing brings them face-to-face with alien creatures, worms on the moon, dinosaurs and prehistoric man on Venus and a dying race on Mars. All standard fare for this era of sci-fi. If I’m honest, Johns could have strung this all out a bit. With the Biggles series behind him, I’m sure his publisher could have been persuaded that each planet warranted its own book. As it is, we land, see some creatures and then make a hasty exit. Much more involved is Ascent by Jed Mercurio published in 2007. We have the life story of Yefgenii Yeremin, and orphan abused in Soviet era homes who works his way through flight school, the Korean War and finally into the Russian space programme. The story is really about the abuses committed by Communism – Yeremin is the greatest fighter ace in Korea but wiped from history and posted to an Arctic wasteland to hide the Soviet involvement in a war they never officially took part in. Eventually he is recruited into the space programme as part of the moon missions, being a man who will risk everything for Mother Russia. Mercurio had taken real history and tweaked it to fit his story. Air combat involves close contact with many famous astronauts, the Americans recruited from those ranks after all so it’s plausible if a little contrived. There’s also mention of the failed Russian moon programme and again, this is partly based on fact. There really was a plan to beat the Americans to the moon but no-one was actually launched in that direction due to technical problems with the rocket. As it is, elements of the Apollo 13 story are taken and woven in to the text, transferred to a fictitious Russian spacecraft. This is much more modern sci-fi. Using a futuristic background to tell a real life story. Our “hero” suffers greatly at the hands of the state. Anyone who knows a little of this history will recognise many of his trials are perfectly accurate. Two very different books then. The older one is a bit of a children’s book, simple story with plenty of daring do, just right for the audience it was aimed at. I quite like a bit of pulp sci-fi so I enjoyed it. Ascent is a very grown up book that isn’t comfortable reading at times. You’ve got to stick with it and if I’m honest, I didn’t care anything for the main character but then the removal of the personal to be replaced by the state was how the USSR worked, so maybe that’s how I was supposed to feel.